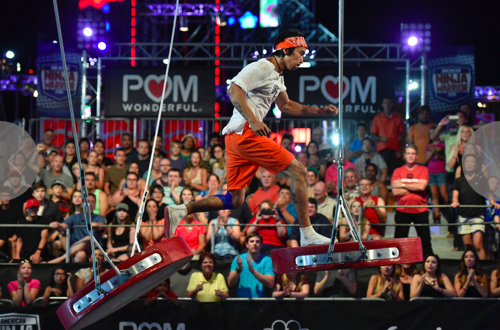 American Ninja Warrior, NBC’s obstacle course competition airs tonight with an all new Monday, August 31 season 7 episode 14 called “Vegas Finals.” We’ve got your recap down below! On tonight’s episode the finalists head to Las Vegas, where they tackle Stage 1 of a four-stage course modeled after the Mount Midoriyama course in Japan. Obstacles include the Sonic Curve and Double Shock. On the last episode re-live the best moments from the season so far during this original, jam-packed special chronicling the best runs of this season. Did you watch last week’s episode? If you missed it we have a full and detailed recap, right here for you. Paul Kasemir is up first. He hopes the first one, easily conquers the Propeller then moves to the Silk Slider which has been a Ninja killer in the past. He makes it. He wedges into the Spider and moves rapidly. The Sonic Curve is easy enough and he barely makes the Warped Wall. He was on the last obstacle and fell. Paul Kasemir is out in stage one when he missed the net. Nicholas Coolridge is next – the only finisher from the Venice city finals. He starts his run and zooms past the Pistons, soars past the Propeller and aced the Silk Slider. He went out on the Jumping Spider. He was off center when he jumped and his right foot slide and he was out of it so soon. Too bad. He was considered a favorite. On the break, Ahmed Toure fell out early on the Propeller. Then Dillon Gates was taken out on the Silk Slider. Robin Pietschmann made it past both of those but wiped out on the Sonic Curve. Next is David Campbell, a veteran of every season of Ninja Warrior. The last few years, he’s gone out on stage one, but will he do better tonight? He makes it past the Silk Slider and sneaks past the Spider. David moves to the Sonic Curve and does it like a boss then goes to the Warped Wall and makes it. #TheGodfather goes to the Coin Flip and was doing well but stumbled and went out. That’s the fourth year he’s fallen out in stage one. He missed from his first step onto that obstacle. David says he’ll be back and needs to have some better luck. Dog trainer Gordon White is already past the Silk Slider and onto the Spider. He’s moving far too slow. He makes it through and then past the Sonic Curve. He’s moseying. He makes the Warped Wall with 36 seconds left for two obstacles. He makes is past the Coin Flip with 14 seconds then falls as he tries for the net. Next up is Tremayne Dortch. He does the first obstacle cautiously then picks up the pace. He misses the landing on the Sonic Curve but then recovers. He snags the Warped Wall and has 36 seconds left. He clears the Coin Flip and has 23 seconds left. He snags the cargo net with 9 seconds left and he slapped the buzzer with just under 2 seconds left. Tremayne is the first finisher in the Vegas finals. On the break, the Propeller took out Marybeth Wang and veteran Karsten Williams. Theo Agu flopped on the Silk Slider landing and Alexio Gomes pooped out on the Sonic Curve. Next up is five-time veteran James #TheBeast McGrath. He makes it past the Silk Slider that took him out last year but just barely. He moves on to the Spider. He wiped his feet first but couldn’t get traction and is out! Artist Neil Craver is next and he’s in gold body paint again. He makes it past the first two then takes the Silk Slider. He moves to the Spider and flies through it. He misses the landing at the Sonic Curve but recovered. He grabs the Warped Wall one handed and keeps moving with a minute left. He kills the Coin Flip and is on the final obstacle. Crazy Craver grabs the net with 30 seconds and slaps the buzzer for the fastest time so far with 22 seconds left on the clock. On the break, Azeo Torre from Venice was taken out by the Propeller. Jojo Bynum finished the course. Abel Gonzalez also finished. Next up is stay at home dad Brian Arnold who went farther last year than anyone else. He makes it past the early obstacles then the Spider. He moves to the Sonic Curve and runs it easily. He takes a practice run then clears the Wall. The Coin Flip is easy peasy and then he’s on the Triple Swing. The Wolf Pack member slaps the buzzer with 22 seconds left on the clock. This is the fourth year in a row he’s cleared Stage One. Next up is Michelle Warnky. She’s cautious on the Piston then moves to the Propeller and clears it. She’s the first women to clear it tonight. Next is the Silk Slider that took her out last year and she sticks the landing then moves on to the Jumping Spider where she takes an immediate fall. She didn’t get a jump deep enough into the wall, made harder by how short she is. Back from the break, it’s legend Sam Sann who has always struggled in Vegas. The giant ring took him out two years in a row. He’s been working on trampoline jumps since then. He goes slow on the Pistons then on to the Propeller. He misses the jump again! That’s the third year he went out on the second obstacle in Vegas. He smiles and says – next year. Geoff Britten is next. He lands the first three obstacles and moves to the Spider which took him out last year. Now it’s the Sonic Curve. He lands it perfectly and moves to the Warped Wall. He’s over it with 1:05 left. The Coin Flip is next and he hops it and survives and is on the Triple Swing. He climbs up and slaps the button with 24 seconds left. He’s the fastest finisher so far. PJ Granger is next and he hops the Pistons, beats the Propeller and moves to the Silk Slider. He sticks the landing and is on to the Jumping Spider. He loses his footing and down he goes. He didn’t hit the trampoline with both feet so his jump didn’t take him deep enough into the wall. Next up is Flip Rodriguez. The mask is off and he starts his run. He takes the first two in stride and lands the Slider too. Next is the Jumping Spider and he’s through that too and on to the Sonic which he clears then he’s up the Warped Wall. He skips right over the Coin Flip and has 50 seconds left when he hits the Triple Swing. He lands on the net and scrambles up to hit the buzzer with 28 seconds left and he takes the fastest run of the night. On the break, Aaron Himelright ended his run on the Spider and firefighter Mike Bernardo completed the course. Kevin Klein also hit the buzzer with four seconds to spare. Next up is gym owner David Yarter who barely sticks the Spider. He makes it through the Sonic and is on to the Warped Wall with more than 30 seconds left. He hopes the Coins and moves to the Triple Swing and slaps the buzzer with less than one second to spare. Next is Tarzan Ben Melick in his loincloth. This is his second year at Stage One. He makes it through the first three obstacles rapidly and moves to the Jumping Spider. He makes it there and he’s on to the Sonic where his momentum sends him down and out landing in the water. But he recovers and heads over to his GF and drops to one knee with a proposal. He has a ring and everything! There are 10 finishers so far and Ryan Stratis is on the course now. He’s already onto the Silks and lands it but it’s close. Now it’s the Spider which took him out two years ago. He makes it and moves to the Sonic Curve which takes him twice to land the dismount. He’s up the wall and on to the Coin Flip then the Swing. He’s got 30 seconds left and hits the buzzer with 14 left on the clock. Long haired operatic crooner Daniel Gil is up next. We see him grooming his hair then he’s off and running. He runs up one side of the Pistons, clears the Propeller and aces the Silks. He moves to the Spider and zooms through to the Sonic Curve which he nails. Now the Warped Wall with no problem then the Coin Flip and he’s got a minute left when he hits the Triple Swing. He lands the net then slaps the buzzer with 38 seconds to go and bests the fastest time of the night by 10 seconds. On the break, six time vet Travis Rosen became the oldest competitor to complete Vegas Stage One at age 41. Next was Brian Wilczewski who also hit the buzzer to move on to Stage Two. Justin Gielski went out on the Coin Flip despite his family’s magic fingers. Next up is stunt woman Jessie Graff. She clears the first two with ease then moves to the Silks where she lands it. She moves to the Jumping Spider and makes through. Next is the Sonic Curve and she starts to fall but saves it. Her time is running out fast and she misses the wall on her first run and misses it again. She’s down to 30 seconds. She misses it a third time and she’s got just 18 seconds. She just can’t get it and her time runs out but she did a great job. Next up is Dustin McKinney who makes it past the Silks then on to the Spider where he skitters along. He takes a break before the Sonic Curve and he has to try twice to land but does then runs the Wall. He’s on to the Coin Flip but breathing hard. He’s on the Swing with less than 30 seconds left and hits the buzzer with seven seconds left as the shortest finisher. Last year the Spider took hi out, this year he’s made it through! Kevin Bull is last of the night. He nails Piston Road easily then soars through the Propeller. He moves to the Silks, nails it and moves on to the Jumping Spider. That’s no problem for Bull and he moves to the Sonic Curve and up the Wall. He may beat the fastest time. He slaps the buzzer with 49 seconds left to take the fastest time and takes the Pom Wonderful Run of the Night.